In the early 1980, in Skyros, the company of popular basis "SKYROS SHIPPING COMPANY" was founded and in May of the same year the company bought the F/B "Katerina", of about 1000 register tons, which was built in 1975 and was renamed "Anemoessa"; after a strenuous effort, the boat was put on, in September 1980, in the local line of Kymi - Skyros, without any subsidy, having daily itineraries and overnight stop at Kymi. The F/B "Skyros" was carrying out the same line, at the same time, having daily itineraries too as well as overnight stop at Linaria. 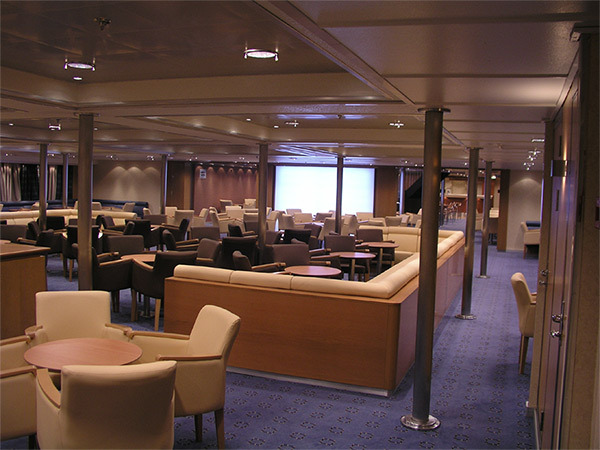 Since 1981, the F/B "Anemoessa" put on, for the summer months, two daily itineraries with connection to and from Kymi via the local bus network KTEL of Evia; since 1983, the space of the ship for the parking lot of the cars became wider. Finally, in 1983, the F/B "Skyros" was withdrawn from the line. In 1984, there was an air connection of the island with a number of daily flights of OLYMPIC AIRWAYS during the summertime and three flights during the winter which, however, were cancelled afterwards. In 1985, the project of the pier for the drawing of the ship alongside, in Linaria, was completed. b) the company "Lines of North Aegean Sea " regarding the routing of the boat in the line of Kymi-Skyros-N. Sporades. 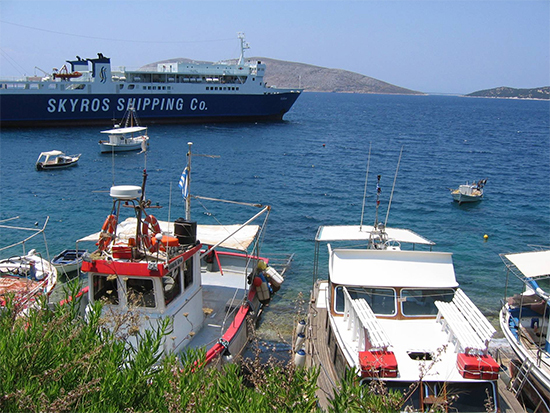 These applications were not accepted, following a justified rejection of Skyros Shipping Company; moreover, the authorisation of routing F/B "Skyros" in the line Skyros - Kymi each Friday and Sunday, which was granted since 1983, was revoked. In December 1988, Skyros Shipping Company bought the Norwegian F/B "ULSNES", which had the capacity of 2000 register tons; the company renamed the boat into "Lykomidis" and, since the early 1989, the boat was put on in the line of Kymi-Skyros replacing the F/B "Anemoessa", which was sold. Since then, F/B "Lykomidis", having daily itineraries during the winter and two or even three itineraries during the summer, has exclusively the service of the local line of Kymi-Skyros. Moreover, since 1995, there were a number of itineraries of Flying Dolphins calling at Kymi-Skyros-Sporades which, in due time, were extended up to Volos and Thessalonica. We would like to point out that, since the regular implementation of arrivals and sailings of "Lykomidis", the local bus network KTEL of Evia scheduled the daily itinerary of a bus for Kymi leaving the KTEL area 3,30 hours before the boat sets sail for Skyros. However, the big problem of replacing the "Lykomidis" with a bigger and newer boat had already came up. This question has given rise to much controversy in and outside the bosom of the general assemblies of the shipping company and there was not any final conclusion. It is certain that the purchase of a modern boat is considered as a necessary and urgent issue, taking into consideration the new conditions of the Greek cabotage. (Admiral Xenophon A. Antoniadis "the chronicle of our marine transport" - News of Skyros- January-November 2000 - Issue Number 287). 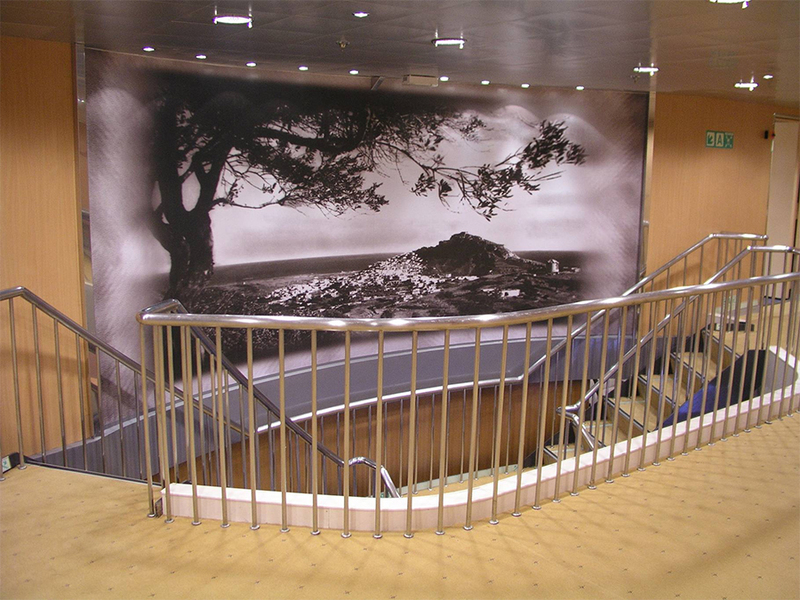 Today, the Company proudly owns the ship Achilleas. It was constructed in Japan on 1987 and completely renovated in Greece on 2004. It is the replacement of Lycomidis. It is bigger thought, with higher speed, and increased capacity of passengers and vehicles. 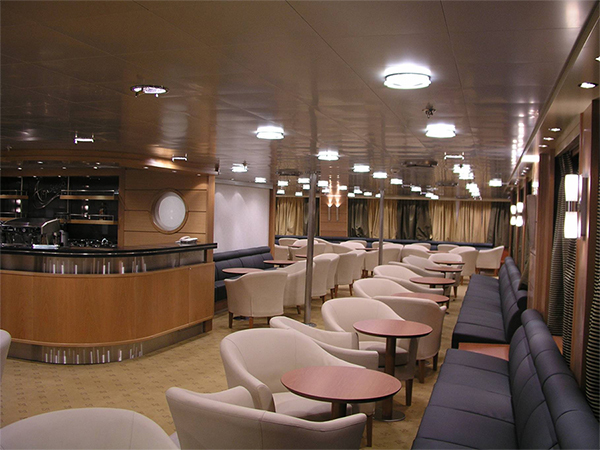 There are three spaces available for passengers, two of them as economy and one as distinguished class. 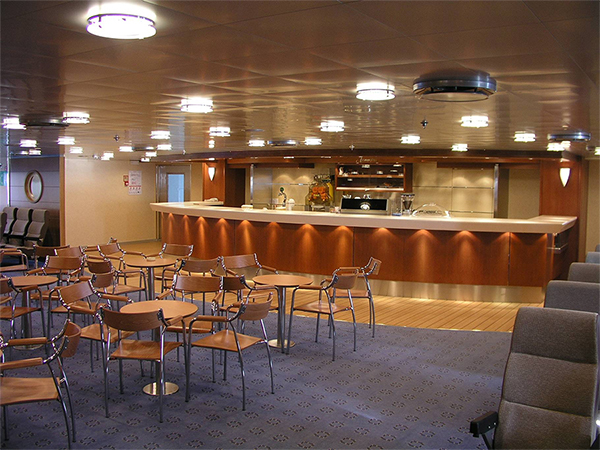 It also has three Bars, one of them open, on the main deck.